Fire Gypsy provides professional entertainment for Christmas Tree Lighting Ceremonies in Massachusetts, Connecticut, Rhode Island, New Hampshire, Maine, Vermont, New York and anywhere in the USA or internationally! Having a Fire Performance at your Christmas tree lighting event is the perfect way to entertain your guests! A fire show will make your Christmas tree lighting a memorable experience for everyone of all ages. Your guests will talk about the fire dancer at your Christmas tree lighting event for years! You'll see incredible fire acts such as fire eating, fire breathing, fire belly dance, fire fans, fire staff, fire hula hoop, fire poi, fire hip belt with palm torches, and many more other fire props! You'll see Sasha execute moves like mind-blowing backbends as she spins balls of fire just inches from her face! Contact us to plan your Christmas tree lighting entertainment with fire spinners and fire twirlers today! 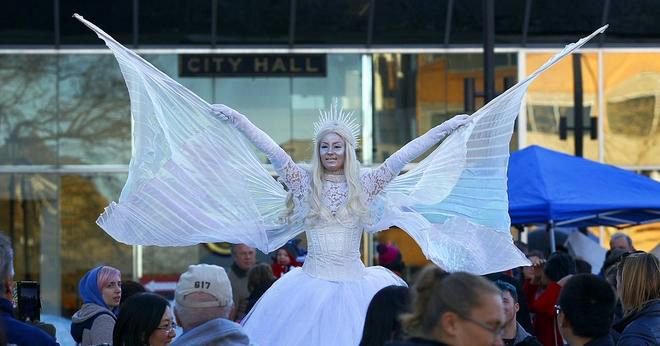 Cool off the day or night with your very own stilt walking Ice Queen for your Christmas tree lighting event! This tall, giant, snow queen comes out only for a few months of the year to bring the cold weather and smiles. Perfect for Winter Fests, Fire and Ice events, Fall Fests, New Year's Eve events, Parties, Parades, and so much more! Light up your Christmas tree lighting ceremony with your very own LED light show performer! Sasha performs with a smart LED hula hoop that creates incredible mind blowing patterns! If you think you know hula hooping, think again! You'll see Sasha LED hula hooping on all different parts of her body that you never thought possible! Sasha also performs LED poi dancing. Have a LED poi spinner at your Christmas tree lighting event. Featuring high tech Visual Poi that we can program with any message, image, picture, pattern, and more! Book a LED light performer for your Christmas tree lighting today!